A Southerner’s backyard is a treasure trove of edible gems during the long, hot summer months. Standing in the yard, I gaze from left to right, each neighbor has a little garden of some sort, revealing characteristics of its caretaker. Some gardens overflow with herbs and spring onions in simple clay pots, others with emerald green bell pepper plants in perfectly straight rows. The more adventurous gardeners have a few chickens strutting about their yard, feasting away on herbs and fallen vegetables. Then, there are those who create raised vegetable beds out of old barbecue pits and tractor tires. I remember tending to our own little garden with my mom when I was a little girl. One night, I sat in the dirt next to the cucumber plants as we began snipping away at a few green onions for our dinner. I couldn’t help but stare at the perfectly ripe cucumbers suspended in midair, reminding me of hanging sausages in a great meat market. I peer under one of the jade leaves and spotted a small cucumber with a bright yellow flower attached at one end. A crack of thunder in the distance broke my focus. Tomato plants sway in the breeze and drops of cool summer rain began hitting our cheeks. “Be sure to peek at this one in the morning,” mom said with a knowing smile. Before it began pouring, we rush inside with fists full of green onions and arms crammed with cucumbers. I thought no more of the gherkin-sized cucumber and continued helping to prepare for dinner as it rained sheets and sheets. The next morning, I walk outside to gather a few tomatoes and herbs for breakfast. Curiosity gets the best of me as I begin folding back the leaf, and lo and behold, the teeny cucumber grew half the length of my forearm overnight. I couldn’t believe it! From that moment on, I thought of cucumbers as being enchanted. They appear mystically in our garden patch after a midsummer storm and disappear just as magically at our table. Note: This is a delicate, quick summer salad, which pays homage to the simple way we prepared cucumbers growing up. There is no need to make this recipe ahead of time, just wait until the last minute to toss the cucumbers in the dressing, or else you will end up with waterlogged cucumbers instead of crunchy, fresh ribbons. Finely chop the garlic clove, red pepper flakes and mint leaves together. Place the seasonings in a medium-sized mixing bowl and add the lemon juice. Whisk in olive oil and season with salt and pepper to taste. Set aside. With a vegetable peeler or a mandoline, thinly slice the cucumber. Once you get to the seeds, begin cutting the other three sides, so all you are left with is the watery, seedy center. Discard the seedy center and toss the cucumber ribbons in the dressing. Once all of the ribbons are coated, lay the cucumbers on a serving platter. Scatter with remaining mint leaves, Parmesan shavings and black pepper. Serve immediately. A few weeks ago, I woke to a wintery Southern fairytale. I leaned my head back, gazed out the window above our bed and saw an icicle the length of a dagger slowly melting away. Drip, drip, drip. My heart skipped a beat. Something magical happened overnight. For those who grew up in the North, I apologize if you can’t relate to my delight of winter weather. Growing up in Louisiana, the closest I got to snow was devouring a jade spearmint snoball on the streets of New Orleans in the dead of summer. Immediately, I threw on my charcoal wool coat, slung my fur stole around my neck, and slipped into my black rubber boots. Michael and I followed our feet to one of our favorite spots in Franklin, the Carnton Plantation. It seems like this is the place we visit whenever the seasons are in their fullest glory, whether the buttercups are blooming, muscadines are ripe for the picking or the leaves are at their autumnal peak. Tiny emerald green buttercup leaves popping through the perfectly blanketed snow caught my eye. Buttercups are one of the first signs of spring around here. It’s our first sign of hope. Immediately, I began dreaming of a budding quiche, sunny and yellow from fresh farm eggs and speckled green with lovely spring onions. We continued walking the grounds of the old plantation. Its large porch flanked with rocking chairs and white columns welcomed us. As I walked across the wooden porch, there was a small groan, like a whisper underfoot. If these floorboards could speak, they would tell a story of war, loss and bloodshed. The Carnton Plantation has a rough past, much like the South itself, but with time the seasons pass, the snow melts and spring appears. Wintertime is necessary for survival, so when spring comes we are prepared; we are ready for new growth. The South has its fair share of tales, but in the end, no one can deny its present beauty, no matter the season. Preheat oven to 350oF. Place a baking sheet in the oven fitted with aluminum foil. Combine flour and salt in the bowl of a stand mixer fitted with a paddle attachment. Create a well in the center and add the lard/butter. Mix on a medium speed until the mixture looks like coarse sand. On a lightly floured surface, roll out the dough until 9 or so inches in diameter. Gently place the dough into an 8” pie plate. Crimp the edges. Without breaking the yolk of the eggs for the filling, use a pastry brush and gently brush a thin layer of the egg white onto the dough. This will create a barrier between the filling and the piecrust as it bakes. Prick the bottom of the pastry with a fork. Place in the fridge for 30 minutes. Meanwhile prepare the filling. Whisk eggs, cream, salt (Keeping in mind that the bacon is already salty!) and freshly cracked black pepper until well combined and fluffy. Set aside. In a medium cast-iron skillet over medium heat, cook the bacon until brown and crisp. Remove the bacon from the pan and add the spring onions. Sauté until the onions start to color and soften, about 2-3 minutes. Drain remaining bacon fat from the pan. Scatter sautéed onions and crisp bacon to the bottom of the pie plate. Add the egg and cream mixture over the onions and bacon. Place in the preheated oven for 40 minutes or until the top is slightly golden, edges are lightly browned and the filling is set in the center. Serve in slices with a salad for a lovely lunch! If you have any leftovers, wrap the dish with cling film and stash in the fridge for a few days. Reheat in a low oven until completely warmed through. Enjoy! Every year, I find myself trying to cling onto the last days of summer. By this point, many Southerners are beyond ready for cooler temperatures and shorter days, which I do love. But there is something about summer I wish I could bottle up: flickering fireflies, warm summer nights, and most of all, its produce. I happily endure the heat to devour juicy, ripe tomatoes, peppery okra pods, blushing peaches and beautiful blackberries. The art of preserving is like a palimpsest, something that has been traced onto the pages of generations before us. With each page, the lines grow fainter and fainter until one day it may completely disappear. So, in pure desperation of holding onto the last days of summer and the art of preserving, I tied my linen apron strings and got to work. I gathered all of the essentials: clean jars, fresh basil, a pot of boiling water, and a crate full of ripe summer tomatoes, anxiously awaiting their moment to be sealed in a mason jar and put away for the chilly months to come. 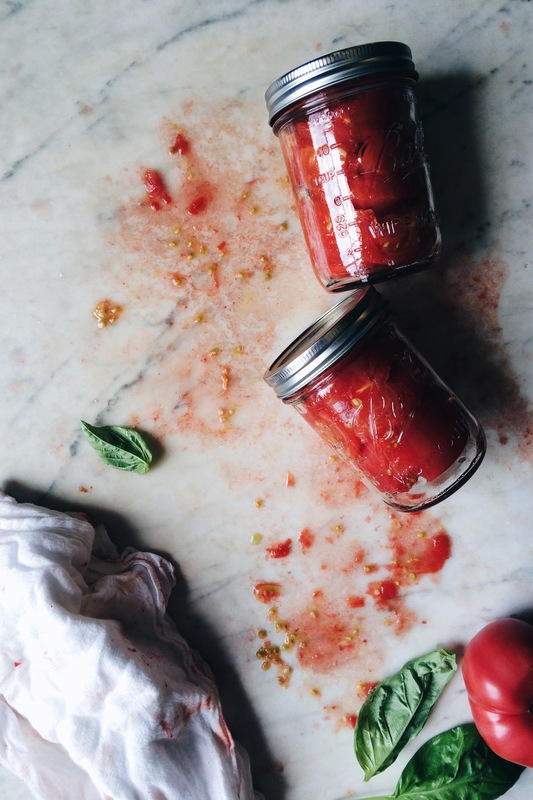 Standing there in my steamy kitchen, with one hand on my hip and the other fishing out jars of sealed tomatoes with my bare fingertips, which I do not recommend, I instantly felt connected with the wonderful women with worn, wrinkled hands that have perfected the art of preserving generations long ago. There is something romantic and beautiful about preserving; in taking something we have in abundance today and saving it for sparse times in the future. The art of preserving is like an act of faith. 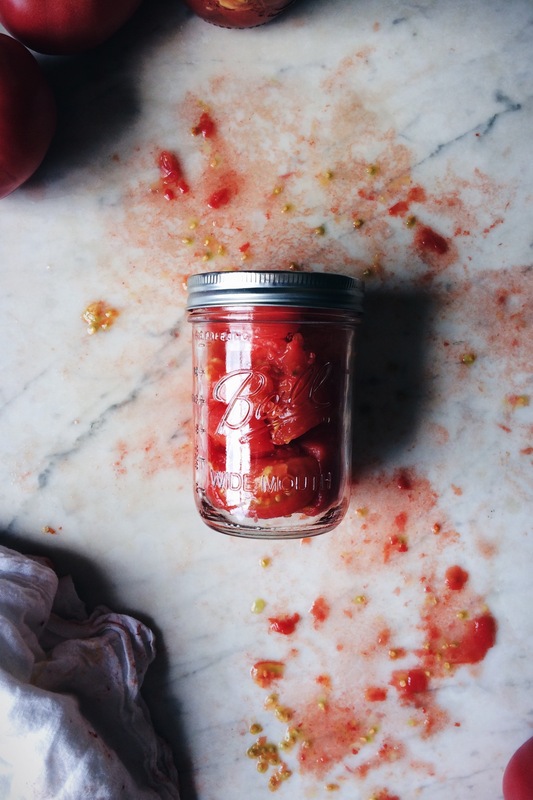 This goes beyond preserving tomatoes; this is a ritual to pass to the next generation in hopes of preserving part of our culture and forever clinging to the flavor of summer in the South. There isn’t a recipe to go along with this post, but I will give you a few steps for canning tomatoes that I found helpful. P.S. Make sure you carefully inspect your jars, lids and rings before using. If you notice any rust, dents or chips, don’t use them for canning, please! Also just as a reference, I bought a 25-pound crate of tomatoes and canned 20, 16 ounce wide-mouth jars. Wash your jars, rings and lids with warm, soapy water and dry completely. Place the jars, rings, and lids onto a baking sheet, making sure the pieces are spaced out and not touching. Place the baking sheet into a 225oF oven for at least 10 minutes. If you keep them in longer, that’s fine, but allow them to stay in for at least 10 minutes, undisturbed. 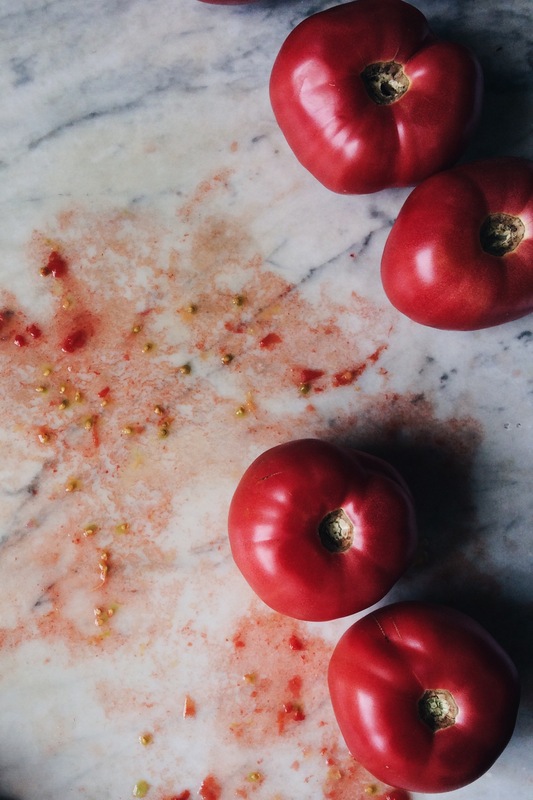 Cut an “x” on the bottom of each tomato and blanch them in a bowl of recently boiled water. Allow them to sit in the hot water for 5-10 minutes, or until the skin comes off with ease. Whenever you are ready to fill the jars, take the baking sheet out of the oven and fill the jars with the peeled and cut tomatoes, placing a fresh basil leaf into each jar. Gently press the tomatoes down, and drain any excess liquid that comes up to the top. Pressing on the tomatoes does two things: you are making sure you are filling all of the space in the jar, and you are getting rid of excess water from the tomatoes. The result: you end up with actual tomatoes in the jar, not just a few tomatoes and tomato water! After you drain the liquid, fill the jar with more tomatoes until the jars are completely filled. With a clean towel, wipe any excess juice or pieces of tomato from the top of the jar. Carefully place the lid onto the jar, making sure you do not touch the bottom of the lid. Screw the lid on tightly. Place the jars in a large stockpot, filling the pot with water so that your jars are covered at least halfway. Place a lid on the pot and allow the water to come to a boil. Once the water begins to boil, set a timer for 15 minutes. After 15 minutes, carefully take the jars out of the boiling water, tighten the lid more if you can, and set the jars aside to cool completely. Make sure you check the seal by pressing down on the top of each lid. If the lid doesn’t budge, great job! Store in a dark, cool pantry. But if the lid pops back, place the jar in the fridge and use a.s.a.p. Sometimes sweet summer pleasures come early in the South. As Michael and I walked toward our local farmers market last week, Michael looked at me and said, “Maybe they will have okra!” I sweetly stated it was probably too early in the season for okra. Honestly, I didn’t want to be disappointed but secretly hoped there would be some too. As we got closer to the market, the first thing to catch my eye was a wooden crate filled to the brim with pinky-sized okra pods. My heart skipped a beat. The first okra of the season! I quickly grabbed a bag and began picking through the precious pods. Almost immediately my hands started to sting a little. The lady tending the market noticed I began itching the back of my hands. “It’s from the okra, isn’t it?” I nodded that indeed it was, but this little bother was about to be well worth it. Whenever I returned home, I laid the emerald beauties on white marble and gently began smashing the ends of the okra with a wooden pestle. As soon as I inhaled the grassy scent of fresh okra and listened to the symphony of sizzle as the cornmeal batter hit the hot oil, I knew I was right. In life, the good far outweighs the bad, and in the end, there’s fried okra. There are some ingredients that beg to be transfigured and transformed like a strawberry pleading to be roasted and paired with a drizzle of balsamic vinegar or sweet white corn steeped in cream, creating a lovely base for a summertime ice cream. But then there are those ingredients I can’t help but prepare the same way, time after time. I have yet to find a more comforting use of okra as being bathed in buttermilk and tossed in cayenne and cornmeal and quickly fried. I believe frying okra is the way nature intended it to be prepared. Why else would it endure and thrive in the Southern summer so much if it didn’t love to sizzle? Note: The original recipe leaves the entire okra pod whole, without cutting off the tops. Personally, I eat the pod whole, but after serving these whole, I found the fried tops left on the platter. So, I decided to take that extra step and cut the tops off since most people don’t like eating the entire pod, but it’s completely optional! Using a flat kitchen utensil like a pestle, meat mallet or even the bottom of a Mason jar, gently smash the okra, starting at the fattest part of the pod, working your way down to the skinny tip of the pod. Place the buttermilk in a shallow dish, and place the cornmeal and cayenne pepper in another shallow dish. Season both the cornmeal and buttermilk with desired amount of salt and pepper. Dip the smashed okra into the buttermilk and dredge in the cornmeal, shaking off the excess. Pour oil to a depth of 2-inches in a large cast-iron skillet. Heat to 350o. Fry the okra in batches, 2-3 minutes or until golden and crispy, turning once. Remove the okra and drain on paper towels and season lightly with kosher salt. Devour immediately! All of the kids were instructed to remain inside and not to peek out the window as the adults “hid” the eggs, mostly in plain sight for the younger kids and in the nooks and crannies of the trees and in the overgrown monkey grass for the older kids. Our baskets filled up with the colorful, hand dyed eggs. Before we knew it, The Hunt was over and it was time for the adults to count our spoils, declare a winner and commenced shelling the eggs to make the best deviled eggs in the whole wide world for our Easter dinner. What I loved most about these eggs is that they were slightly hued from being dyed the day before. I adored that. Easter was the only time of the year when I could eat blushing pink, buttercup yellow and robin egg blue eggs. 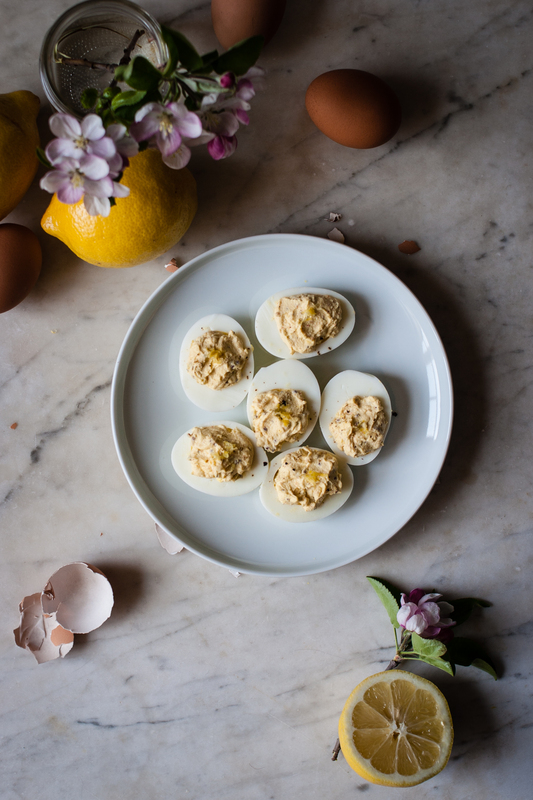 I cherished deviled eggs because they only seemed to grace our table at special occasions. Now, whenever these reverent beauties are prepared in my kitchen I am reminded of the mad dash of Easter attire and disheveled baskets in absolute eagerness of The Hunt. 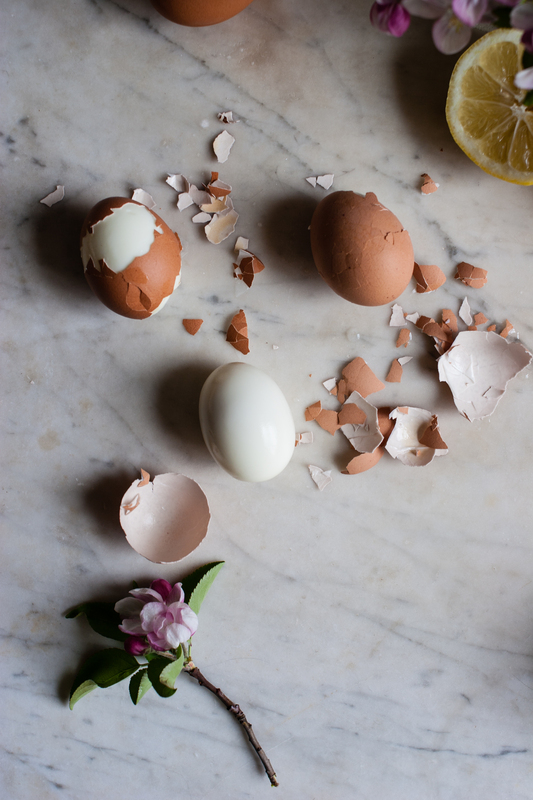 Note: Growing up, these eggs were a treat to have on our table. I, however, cannot wait for a special holiday to make them, so I whip these up at least once a week to devour as a midafternoon snack. Also, if you can’t get your hands on crème fraîche, you can use sour cream in a pinch. 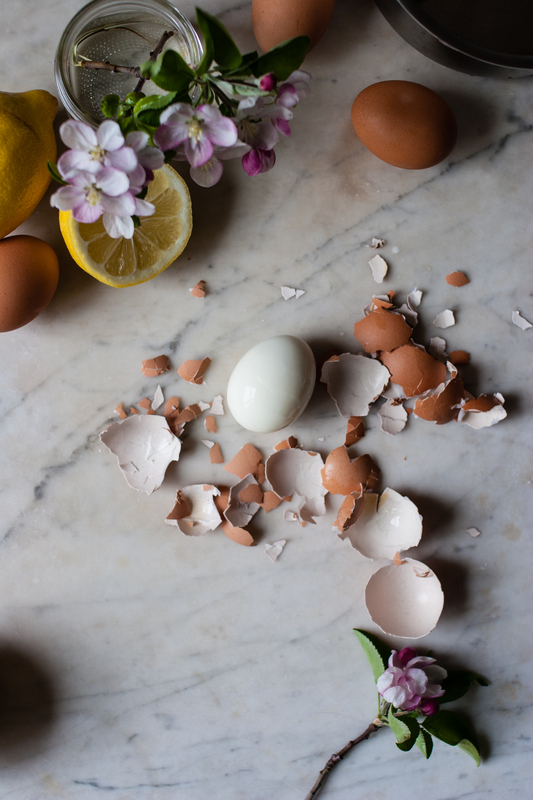 Gently scoop the yolks out of the hardboiled eggs. Place the whites on a plate and place the yolks in a bowl. Add the rest of the ingredients to the yolks. Stir the ingredients together while breaking up the yolks with the back of a fork. Taste the deviled egg mixture for seasoning and adjust as needed. Using two teaspoons, scoop deviled egg mixture into the egg whites. Garnish with more lemon zest, black pepper and cayenne. There are some things in life which people call guilty pleasures, but I think pleasure is something we should seize, not something we should feel the least bit guilty about. If something gives you gratification, embrace it, and if at all possible, allow that pleasure to be part of your everyday life, especially if that indulgence can be found in the kitchen, which many of mine are. 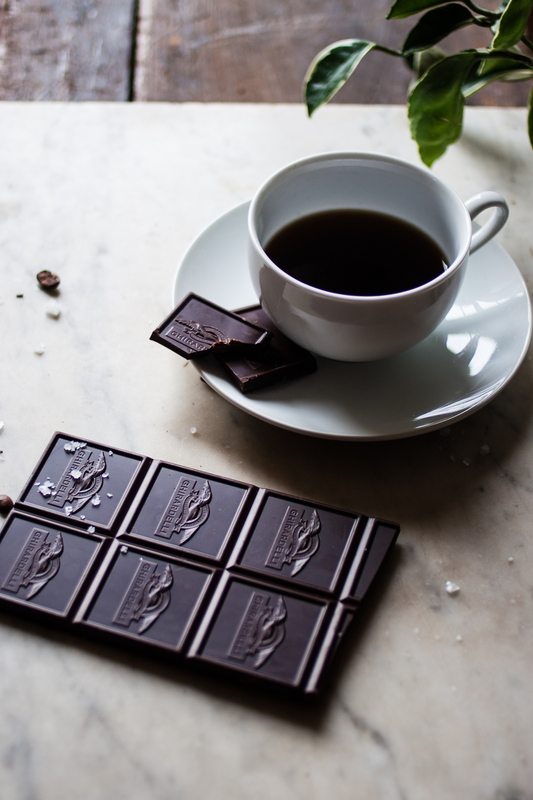 One of my pleasures comes in the form of sinisterly dark chocolate, perfectly paired with sea salt and smoky, chicory coffee. Slowly cracking open the fridge, I pull out a cherished square of chocolate that I secretly tucked away for safekeeping. To its gleaming, chilled surface, I sprinkle on tiny shards of winter white salt. 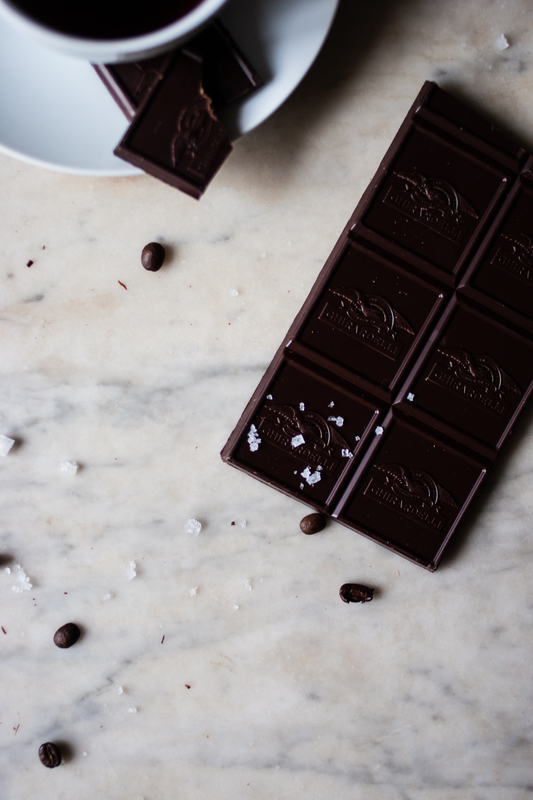 The contrast between intensely dark chocolate and starkly white salt gives me a certain, unspoken gratification. The kettle begs for attention as it whistles from the stove, steam rises from the coffee press, and I magically become transported to a place all my own. 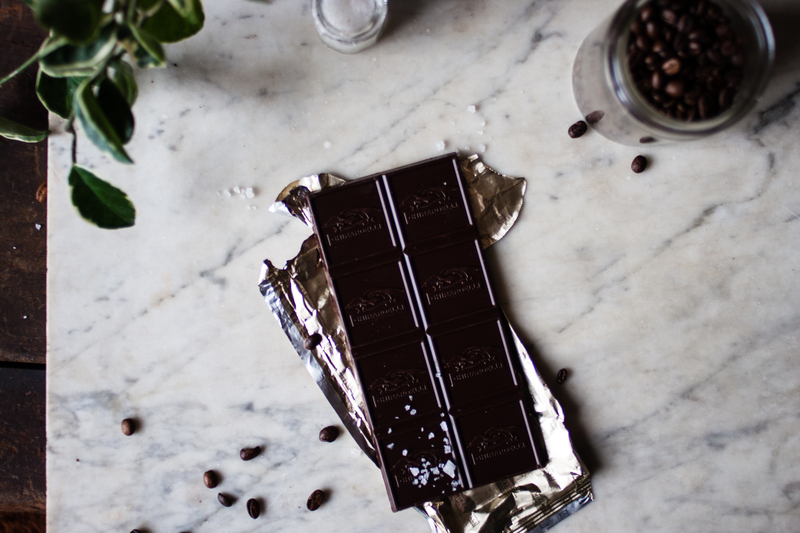 I sit on the counter in my kitchen, dark chocolate speckled with crunchy sea salt in one hand and earthy chicory coffee in the other and become lost in downright decadence. When my days are filled with so many things that plead for my attention, it’s in these moments that I take time out for myself, which is something I never feel guilty for. This cast of characters always has a place in my home, but even when I’m far away, I know if I have a piece of dark chocolate sprinkled with salt and an afternoon cup of coffee, I can delight in my daily pleasure and never feel the least bit remorseful. I think that’s the way pleasures in life should be, or at least the ones that take place in the kitchen. 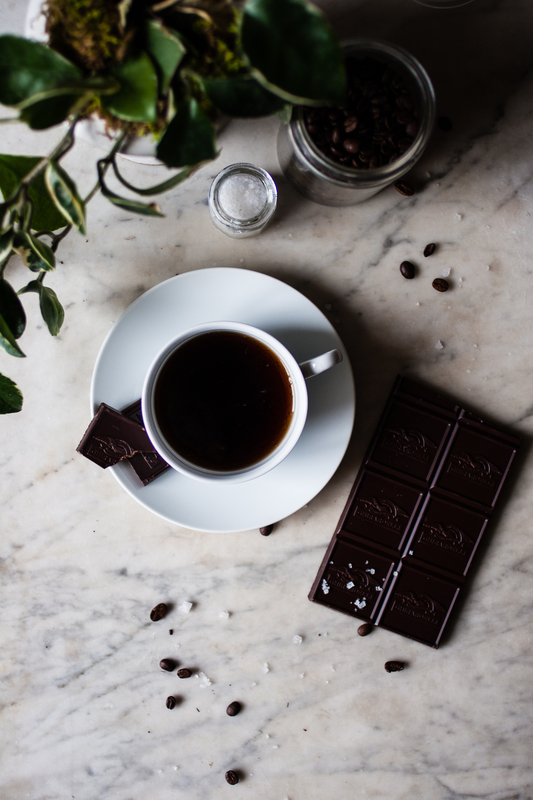 Many thanks to Ghirardelli Intense Dark Chocolate for sponsoring today’s post and allowing me to share my perfect pairing. If you would like to share your perfect pairing as well, upload your Ghirardelli Intense Dark photos here or #IntenseDark on Instagram. I’d love to hear what y’alls favorite pairings are! While driving down the long, dusty road to Lacassine, Louisiana, cleared sugarcane fields revealed new life from the rich soil and a mellow, sweet fragrance filled the warm air. I imagined the empty field later in the year, taking over the landscape with its towering pampas-like foliage. As I became entranced by the pale jade landscape, we crept closer and closer to my great grandma’s house. I tiptoed across the tiny, white shells in my great grandmother’s driveway and peaked around the corner of her small, whitewashed house and stepped into the garden. To me, this was an enchanted backyard, filled with life from one end of the tiny lot to the other. Strategically placed rows of perfectly ripe tomatoes and fingerlike okra pods smelled of sweet grass as I walked by. Tiny yet vibrant red and green peppers pirouetted in the breeze, reminding me of flickering Christmas lights. A protective fig tree magically became the perfect umbrella to take refuge under in the midst of afternoon showers, and near the back of the property, there was a gaggle of disgruntled chickens that became ruffled around the feathers if you got too close to their coop. On this particular trip, I decided to keep my distance from the foul fowls and kept to the side of the house, close to my grandmother. She was reaching over her head, picking what looked like spotted yellow basketballs. Quietly and curiously, I filled as many plastic shopping bags with the enormous unidentified fruit as I could and piled into the backseat of the car. I remember how the combination of the saccharine air from the sugarcane fields and the fresh scent of the mysterious citrus resting on my lap made my mouth water. Immediately when we got back to the house, my grandma grabbed a large carving knife and split the colossal clandestine citrus in half, revealing blushing pink flesh. My grandma smiled proudly and said in her sweet Cajun accent, “Dat’s a biiggg grapefruit!” My mouth dropped in sheer disbelief, and we both started laughing and began ripping into the slightly sweet and tart flesh. With a mouthful of ruby grapefruit and pink juice dribbling down my chin, I wondered what the secret was to the gigantic, sugary grapefruits that grew in my great grandmother’s backyard. Suddenly, I recalled the soft, spring breeze coming from the sugarcane field across the way and became sweetly satisfied in solving the mystery of the prodigious grapefruits. Note: If you don’t have plain yogurt or buttermilk in the fridge, have no fear. Just add 2 tablespoons of grapefruit juice to 1/3 cup of milk and let it sit on the counter for 5 minutes to get nice and funky! It works perfectly in a pinch! 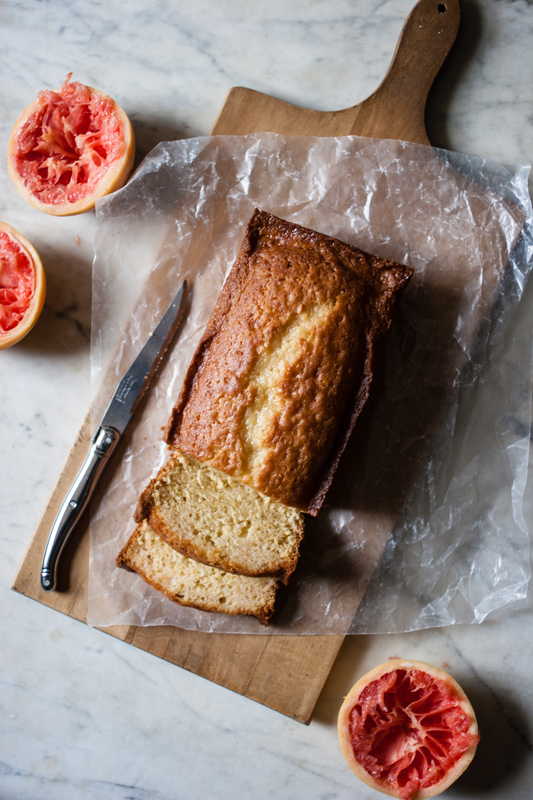 Using the zest and juice from 2 medium-sized grapefruits for this recipe usually makes enough leftover juice for a simple glaze. 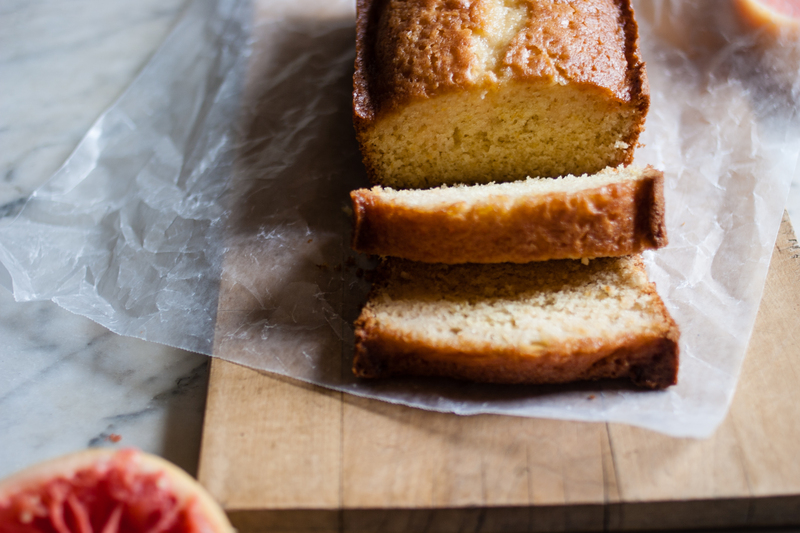 Just whisk ½ cup of powdered sugar while slowly adding the leftover grapefruit juice until you have a smooth, thick glaze. Pour the glaze over the cooled cake and serve! Preheat oven to 350 degrees. Butter and flour a 9×5” loaf pan. In a glass-measuring cup, combine 2 tablespoons of grapefruit juice and buttermilk (or yogurt). 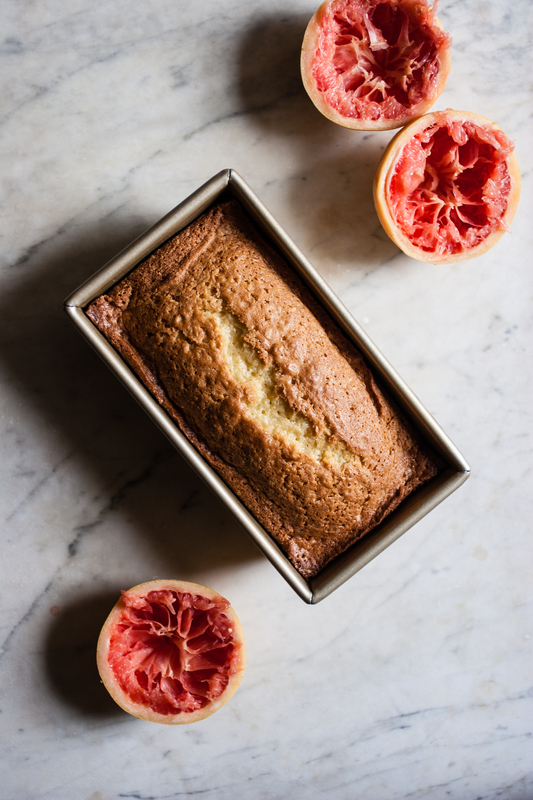 In a large mixing bowl, add grapefruit zest, ½ cup of granulated sugar, and raw cane sugar. Rub the zest and sugars together with your fingertips. Whisk in the oil until smooth. Add eggs, one at a time, and whisk until combined. Scrape down the bowl. Add the flour and buttermilk mixtures to the cake batter, beginning and ending with the flour. Spread the batter into the prepared pan, smooth the top and tap the pan on the counter a few times, releasing any bubbles in the batter. Bake for 45 minutes to 1 hour, until a cake tester comes out clean. Meanwhile, combine remaining 2 tablespoons of granulated sugar with 1/3 cup of grapefruit juice in a small saucepan, and cook over low heat until the sugar dissolves. Set aside. 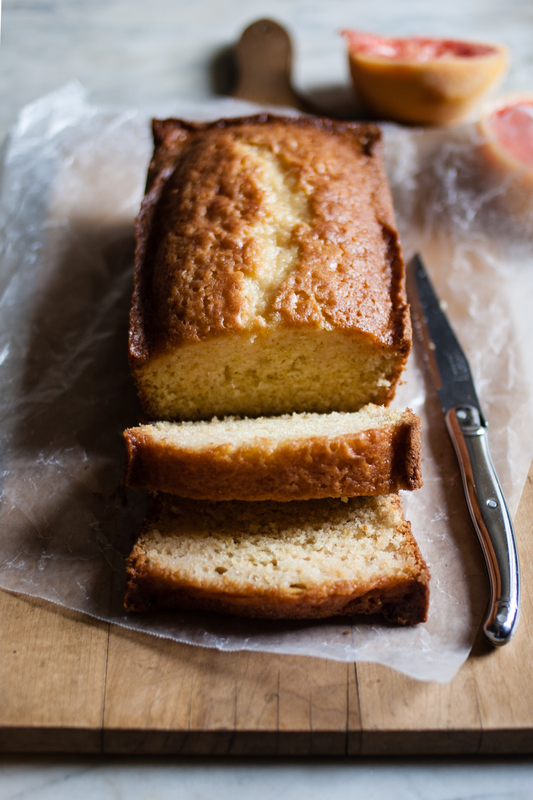 When the cake has finished baking, let it cool for 10 minutes and invert onto a cooling rack with a tray underneath. Poke holes in the cake with a skewer or toothpick and brush the grapefruit syrup over the cake. Allow the cake to cool completely while absorbs the syrup. Serve the cake all by itself or create simple glaze to pour over the top (see note). Enjoy!